These Paleo Nashville Hot Grilled Chicken Tenders are marinated in a spicy concoction of cayenne pepper, honey, chili powder, and other spices. If you’ve been a reader of the blog for any length of time, you’ll know that I don’t care for extremely spicy foods, or as my daughter tells it – I’m a spice wimp. I can tolerate some heat in foods. I mean, I want to taste the food that I am eating not just spicy sauce or hot peppers. My daughter has no level of “hot enough” or she hasn’t found it yet. I make dishes that I think “This is it! This is HOT enough for her!” WRONG, her answer is, “could be spicier.” So, I decided to try this recipe to see if it could be hot enough – if you’ve had Nashville Hot chicken before then you know it’s not mild by any means. Just whisking up the marinade, my sinuses cleared instantly. I marinated the chicken for about 6 hours, but you can let it go anywhere from 2 hours to overnight. Before you marinate the chicken, reserve a few tablespoons to brush over the cooked chicken to give it an additional zing. Since we are trying to eat more paleo meals, I changed the brown sugar to honey, and the vegetable oil to olive oil. If you’re wondering how this went over, wonder no more. It was way too hot for me but the flavor profile was delicious on the chicken. My daughter and husband loved it with the kid saying, “it’s spicy, but could be spicier.” Ugh! At least she enjoyed it. 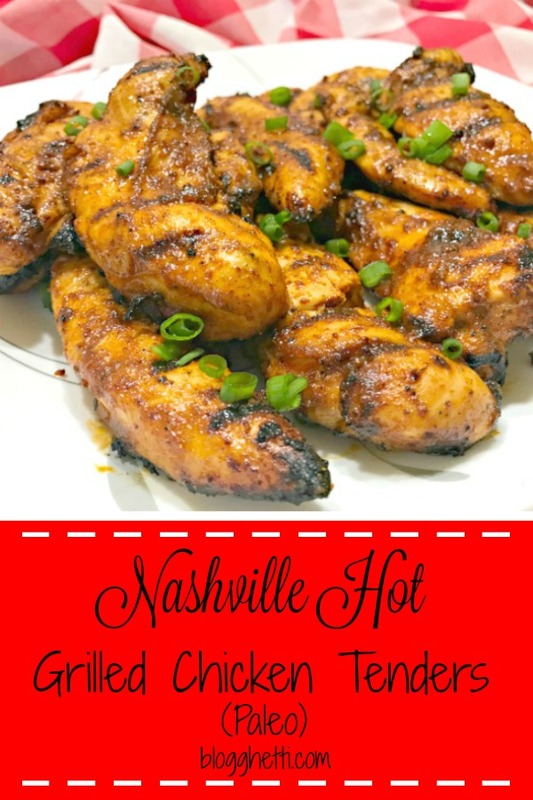 Paleo Nashville Hot Grilled Chicken Tenders Author: Lisa Kerhin These Paleo Nashville Hot Grilled Chicken Tenders are marinated in a spicy concoction of cayenne pepper, honey, chili powder, and other spices. Place chicken in a large resealable plastic bag and pour marinade over chicken. Close bag and massage chicken to get all of the pieces coated with the marinade. Refrigerate for at least 2 hours to overnight. When ready to grill, remove chicken from marinade and cook on grill until done, 8 to 10 minutes. Turning once, halfway through cooking time. Remove chicken from grill and brush with reserved marinade, if desired. Really cool to see this…our son and daughter-in-law recently moved to Nashville and he told me just last week about Nashville chicken – how hot, but delicious, it is. Yours looks so good and I’m going to give it a shot here at home and see how it goes with the rest of the family. I’m with you – a bit shy of super hot – but it looks so yummy, I have to give it a try now. Thanks for sharing! Can’t wait to try it. Karen, I hope your family enjoys the chicken! I have had the Nashville Hot Fried Chicken before and will admit the level of the heat is up there but I could tolerate it a bit more. I guess frying it helps haha.